This is Diva, our new Jack Russel Terrier. She rolled around in another dog's urine while we were visiting my family. Since she was still relatively new to us, we had not yet bathed her and judging by how she behaves around water, we expected to have a real fight on our hands. My brother in law told us about a doggie spa in town where they have an elevated tub and all the grooming tools you need to get your dog clean. She was hesitant to get in the tub and fought a bit when we first began to spray her, but once she realized how much good attention she was getting plus an all over body massage, she took right to it! 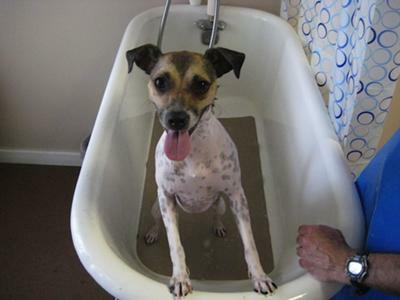 She was so happy and good during her bath that this picture ended up on the website of the doggie spa. Looks like she is a Diva in the making. Already getting used to spa treatments!